Hyaluronic acid is a substance that is produced naturally in the human body. It is widely used by the cosmetic industry in dermal fillers as well as dozens, if not hundreds, of over-the-counter serums, moisturizers and creams. The main benefit of hyaluronic acid is its ability to help your skin retain moisture. Keeping your skin properly hydrated improves its elasticity, making it look and feel firmer while reducing the appearance of wrinkles. Hydration is also crucial for preventing dryness and flakiness, and can give your skin a more radiant glow. Hyaluronic acid also helps to repair skin damage. A number of studies have shown that hyaluronic acid can regulate inflammation and support the regeneration of damaged tissue. This means it can help your wounds heal more quickly and reduce pain. Other investigations have found that hyaluronic acid has potent antibacterial properties, which may reduce the risk of infection. 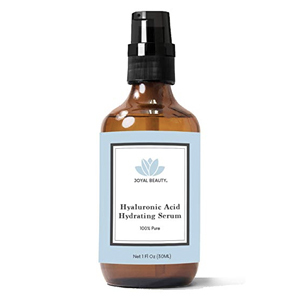 Hyaluronic acid serums are skin care products designed to penetrate deep beneath the surface of your skin. They usually contain fewer fillers and sealing ingredients than moisturizers and creams. Serums can be formulated to address specific skin concerns, including acne, sun damage, discoloration and more. If you have naturally oily skin, serums can be used as standalone products; for dry skin types, you may need to apply a moisturizer on top of your serum to keep your skin nicely hydrated. Moisturizers are primarily designed to hydrate your skin by sealing in moisture. They are generally considered to be heavier than serums but lighter than creams. Moisturizers have relatively large molecules, which means they cannot penetrate as deeply as serums. Many moisturizes can be used daily or even twice daily. Creams are heavier than both serums and moisturizers. They have a thick consistency and work by creating a physical barrier that seals the skin to lock in moisture. Creams typically have relatively high oil content and are often used at night to rejuvenate your skin while you sleep. » If you are struggling with blackheads and acne, you may want to try a peel off charcoal mask along with a hyaluronic acid product. Charcoal masks are ideal for those with oily or acne-prone skin. The best moisturizers provide your skin with the hydration it needs to stay healthy, radiant and youthful. We chose the products below based on their ingredients, user reviews and price. 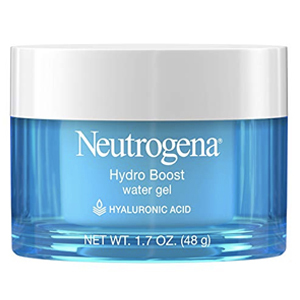 Featuring a non-comedogenic formula that is oil-, dye- and fragrance-free, Neutrogena Hydro Boost is an excellent choice for anyone in search of a powerful hydrating moisturizer. Best at: Absorbs quickly like a gel, so you can wear it under makeup, but provides long-last and intense moisturizing power of a cream. Some users don’t like the smell. 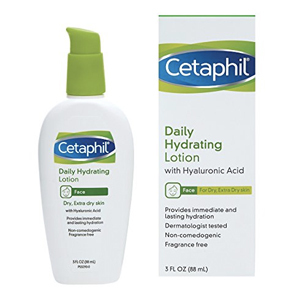 Cetaphil has a reputation for creating gentle skin care products and its Daily Hydrating Lotion is no exception. This lightweight moisturizer is great for sensitive skin and provides good daily hydration without leaving your skin feeling greasy or sticky. Active ingredients: Formulated with hyaluronic acid and strong humectants, provides daily hydration to skin. Can be used effectively under makeup. Too lightweight for some people. 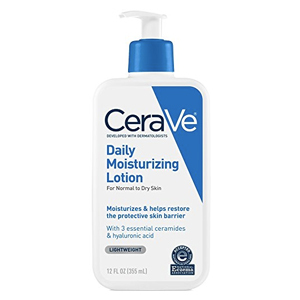 Designed to provide 24-hour hydration, CeraVe Daily Moisturizing Lotion is a good option for anyone looking for an affordable and very popular moisturizer. Best at: Helps restore the protective skin barrier with three essential ceramides. The cheapest moisturizer in this category. Suitable for both dry and oily skin types. Looking for a moisturizer that doesn’t just hydrate your skin but also protects you from harmful UV rays? Featuring broad spectrum SPF 30 and packed with a range of powerful antioxidants, Garnier SkinActive is an excellent candidate. Active ingredients: Formulated with hyaluronic acid, vitamin C and E and antioxidant goji berry and pomegranate. Stings if it gets in your eyes. Hyaluronic acid creams don’t just provide intense hydration. They are also designed to rejuvenate your skin and keep it looking youthful through the use of powerful anti-aging ingredients. 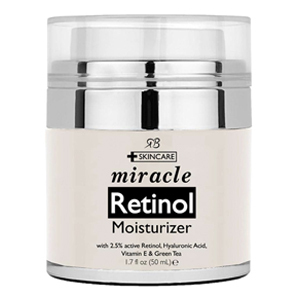 Packaged in a convenient pump jar, Miracle Retinol Moisturizer Cream contains a variety of ingredients that have been proven to support skin health, including retinol, vitamin E and green tea. Active ingredients: Contains 2.5% active retinol, hyaluronic acid, vitamin E, and green tea. Some users find the consistency too heavy. 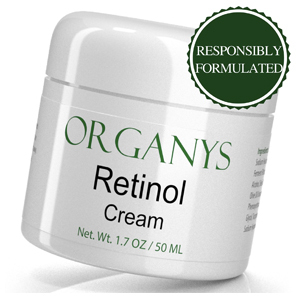 Made using a range of active ingredients including hyaluronic acid, aloe vera and retinol, Organys Retinol Cream is designed to keep your skin hydrated, repair skin damage and improve overall skin tone. Best at: Evens out the tone and texture, improving the look of fine lines, age spots and acne scars. Doesn’t feel as thick as other creams. 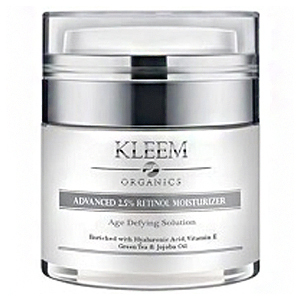 Formulated using retinol, hyaluronic acid, vitamin E, green tea and jojoba oil, Kleem Advanced Retinol Moisturizer Cream is an excellent choice for anyone looking for an effective organic moisturizing cream. Best at: Guarantees collagen and elastin production to reduce the appearance of wrinkles, crow’s feet, circles & fine lines. The skin around your eyes is often one of the first places to show the signs of aging. 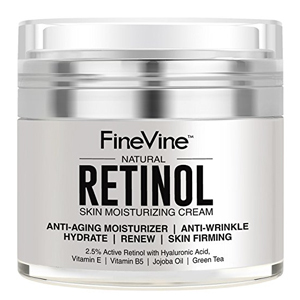 FineVine Natural Retinol has been specifically designed to keep your skin healthy and hydrated while restoring lost elasticity. Best at: Boosts hydration levels, speeds cell turnover, restores lost elasticity and ensures long lasting moisturizing all day long. Pump mechanism is prone to breaking. The hyaluronic serums below have been selected for their ability to penetrate deeply and hydrate the skin from the inside out. Featuring a lightweight formula that absorbs quickly, Revitalift from L’Oréal can be used twice a day to hydrate your skin and visibly reduce fine lines. Best at: Plumps and hydrates your skin while visibly reducing wrinkles. Contains no parabens, mineral oils or dyes. 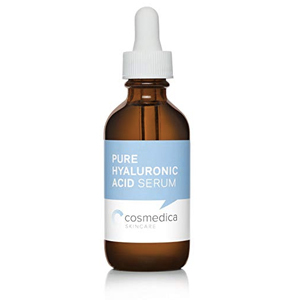 Cosmedica Hyaluronic Acid Serum is made to hydrate the skin and improve skin texture. 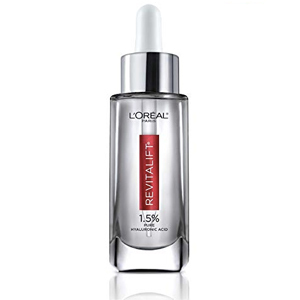 It contains a pure hyaluronic acid formulate comprised of distilled water, hyaluronic acid and 0.5% benzyl alcohol. 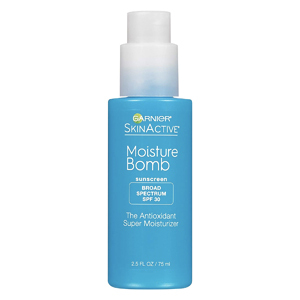 Best at: Improves skin texture and brightness with intense moisture and balance. Hydrates skin while diminishing fine lines. Some users find it makes their skin feel overly tight. 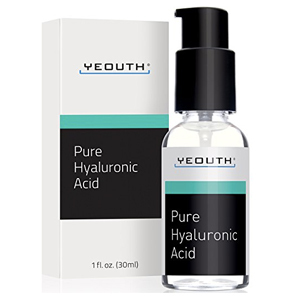 YEOUTH Pure Hyaluronic Acid is formulated to be as gentle as possible on the skin while still providing excellent hydrating action. Best at: Plumps and hydrates. Leaves no redness or irritation and is non greasy. Can leave the skin feeling tacky. Joyal Beauty Hyaluronic Acid Hydrating Serum helps keep your lips hydrated and fresh while reducing the visibility of fine lines. Active ingredients: Highest pure hyaluronic acid concentration on the market. Highest pure hyaluronic acid concentration on the market. Remove your makeup, if you wear any. Apply a cleanser, then a toner to your face. If you’re using a new hyaluronic acid product, test it in a discreet area before applying to your face to see how your skin reacts. Apply your hyaluronic acid product, ensuring that the skin is slightly wet. It’s essential that your skin be damp as this allows the product to absorb effectively. Apply sunscreen if your hyaluronic acid product does not provide sun protection. Most serums and moisturizers can be safely used twice a day while many creams are designed to only be used at night. Read the label for instructions specific to your product. Hyaluronic acid is a natural substance found in many skin care products. It’s very effective in its ability to keep the skin hydrated, helping to make it look and feel firmer while diminishing the signs of aging. There are many products on the market that contain hyaluronic acid, including a great range of serums, moisturizers and creams. While there is ultimately no singular best product when it comes to skin care, the products described above are an excellent starting point for anyone interested in maintaining healthy, beautiful, hydrated skin. Litwiniuk, M., Krejner, A. (2016). Hyaluronic acid in inflammation and tissue regeneration. Wounds. Karen L., GoaPaul Benfield. (1994). Hyaluronic Acid. Drugs.